“Where did your inspiration come from?” It’s my favorite question to ask, of painter or poet, composer or comedian, and one of my favorite questions to answer. 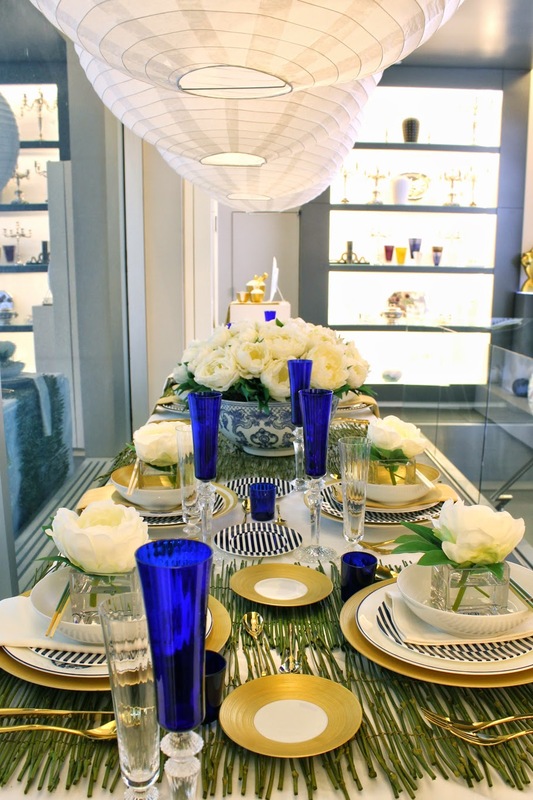 Setting the table at Michael C. Fina was a refresher course, for me, on how ideas blossom and unfold, get rerouted or retooled, on any project or creative process. 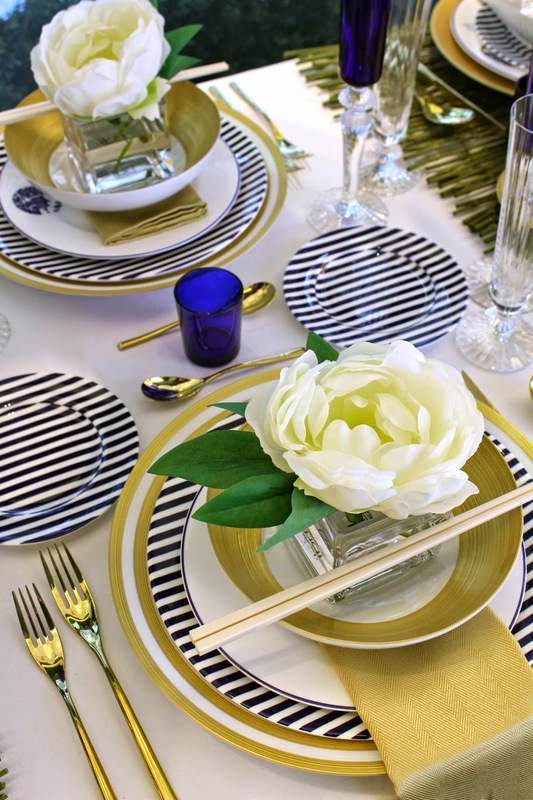 I love tabletop design, whether styling them for clients or photoshoots, or covering great events like the annual Dining By Design to benefit DIFFA. 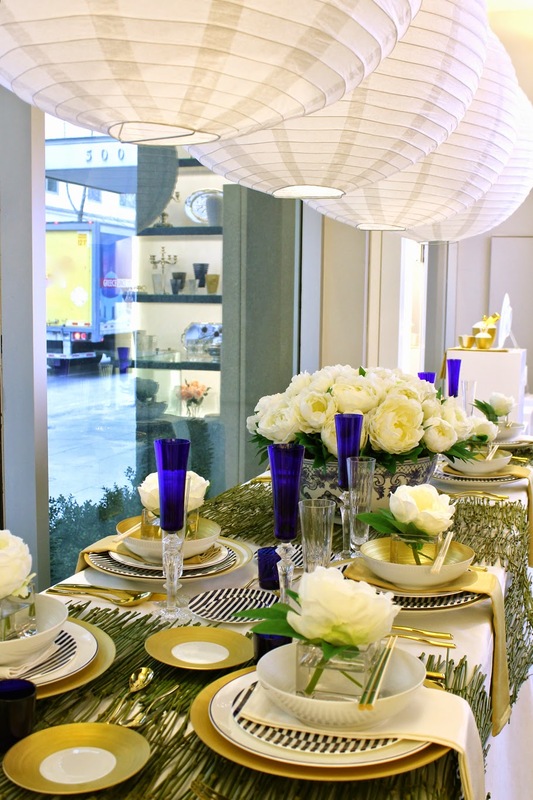 So it was beyond a thrill to be asked by New York’s preeminent table-top source, Michael C. Fina, to style not just a tabletop, but the main window of their glittering Manhattan flagship. I have to admit, the timeline between the offer and the deadline (a great reunion party for the participants and donors behind Holiday House 2014, of which Michael C. Fina was a most generous one) disappeared like a fistful of water, and intended planning sessions were postponed by more than one of this winter’s “snow events” and a few of my own urgent client deadlines. So by the time I got into the showroom to meet, measure, and discuss, we were a mere dozen days away from install. Yikes. Here’s how it all unfolded, how we made the deadline work (and who helped, immensely, to make that happen), where the inspiration came from, and the lessons I learned along the way. I do it in client homes when stretching a budget, working within the confines of a rental, or when creating vignettes for Housing Work’s Design on a Dime: Build from your givens, existing, donated or just plain available. It maximizes both time and money. I love working with givens, helping homeowners fall back in love with something they thought was long-gone in terms of inspiration or design merit. The main window already had a long table in it, so we’d start there... and let’s face it, doing an actual tabletop setting, for a tabletop purveyor is no real stretch. 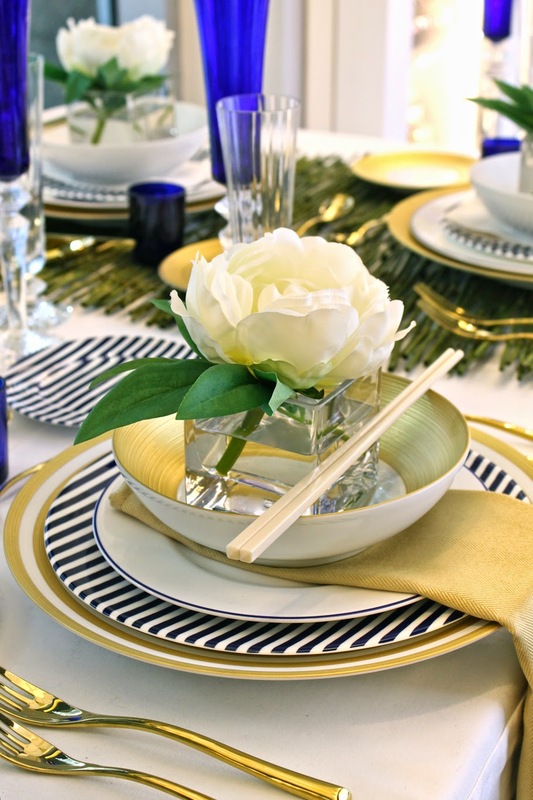 (Plus, did I mention I LOVE to style tabletops?). So, okay, the foundation was in place. But, yowza, that table is a nine-footer. We’d need a LOT of product. But we had the whole of the showroom from which to pick, right? Well, yes, and no. As many in the business of interiors know, “stocked” and “in stock” are not one and the same, and some things weren’t readily available in the considerable multiples we needed. And as any designer who’s worked with a Pinterest-obsessed client, having what seems to be an unending source of choice doesn’t always help narrow the field, or get a project any closer to the finish line. It seemed that way with the seemingly bottomless well of product and inspiration surrounding me at Michael C. Fina. 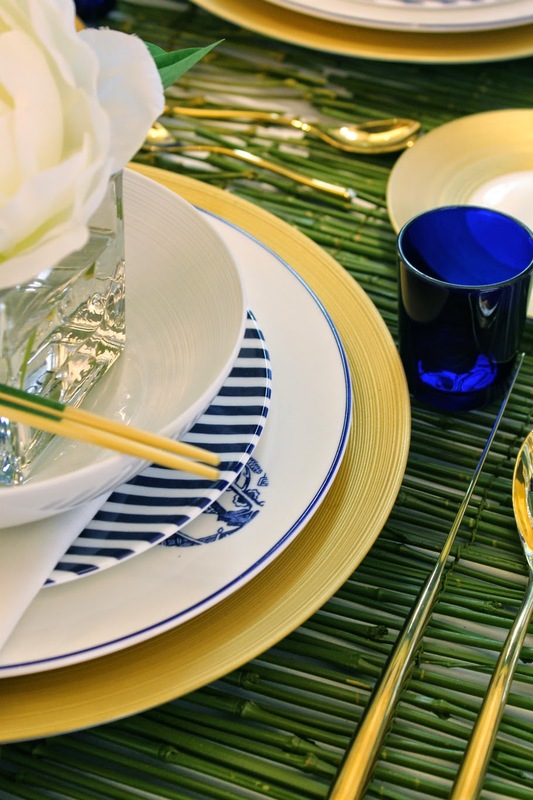 When you are smack dab in the middle of their stellar and staggering selection of china, crystal and flatware, there is no shortage of inspiration... but sometimes, too much to work from isn’t all that helpful, either, especially when the clock is ticking. Luckily, I was working with Michael C. Fina’s calm and lovely in-house Merchandising and Visual Planning guru Jenny Lim. She steered me towards lines she knew she had in stock as we wandered (me, a wide-eyed kid in a candy store, with “candy” by the likes of Baccarat, Bernadaud, Juliska and Rosenthal.) 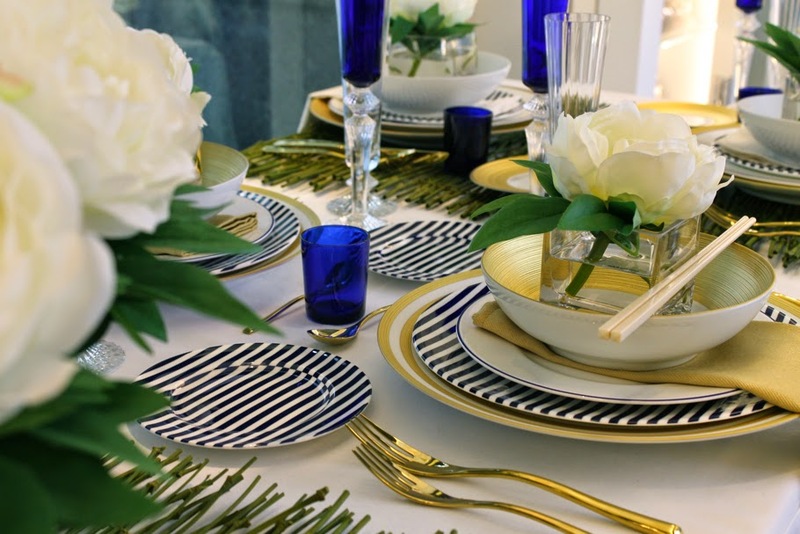 During the store tour, the graphic, bright and banded Hemisphere Gold Stripe, Matte White, and Matte Gold patterns by Jean-Louis Coquet were quick to catch my eye. 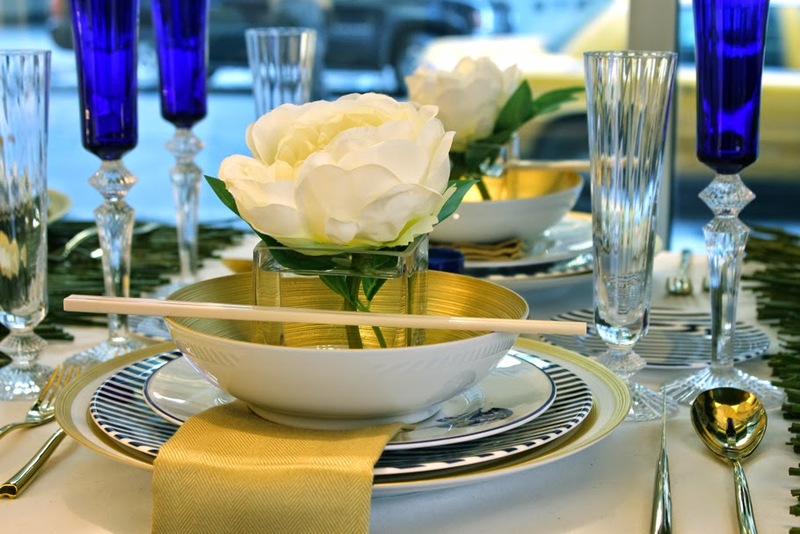 What also caught my eye, early, was the Blue Dragon pattern by Mottahedeh, and it seemed like with a white, gold and blue scheme and that gorgeous dragon pattern, we were really on to something for an upbeat and eye-catching tablescape. So, with visions of dragons and gold, stripes and cobalt blue, I went back home to plan. 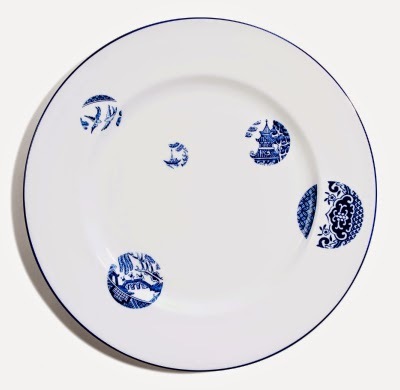 Back to the showroom I went, planning on capping a mixture of these patterns with those Mottahedeh dragon plates, which had also mixed in my mind with the Blue Willow to start to tell a great contemporary Asian-inspired spring garden table. But alas, that mix only worked in my head and on my monitor, and I learned my first china lesson: bone china and porcelain don’t always play well together, with both a considerable difference in background white color, and how the glazes (in this case, both cobalt) react (one, crisp and graphic, the other, organic, “bleedy” and painterly). While both were still beautiful, pulling them together called attention to the differences in a way that didn’t do either any favors. Suddenly, I lost my dragons, the very first piece of inspiration I felt really good about, the one that seemed to kickstart the whole plan. Not to panic. I’ve lost major inspiration pieces in client projects, upfront, when a client didn’t share my enthusiasm, or in the eleventh hour, when something’s out of stock or even discontinued. I still had plenty to work with (a total of five patterns to alternate, mix and match). 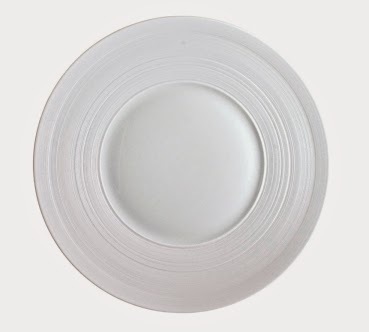 Still good, and this old dog learned a new trick about bone china along the way. 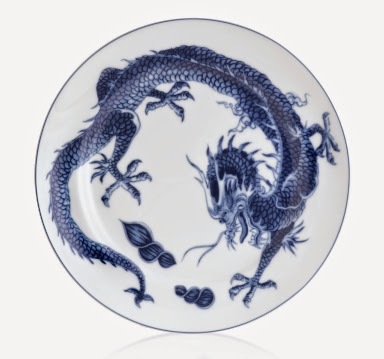 While it was the dragon which whet my Asian appetite, other things pointed me down the path to an Asian-inspired table once he was out of my grasp: that Blue Willow pattern, the lantern-like ribbed texture and nearly-half-moon shape of the Coquet Hemisphere bowls. 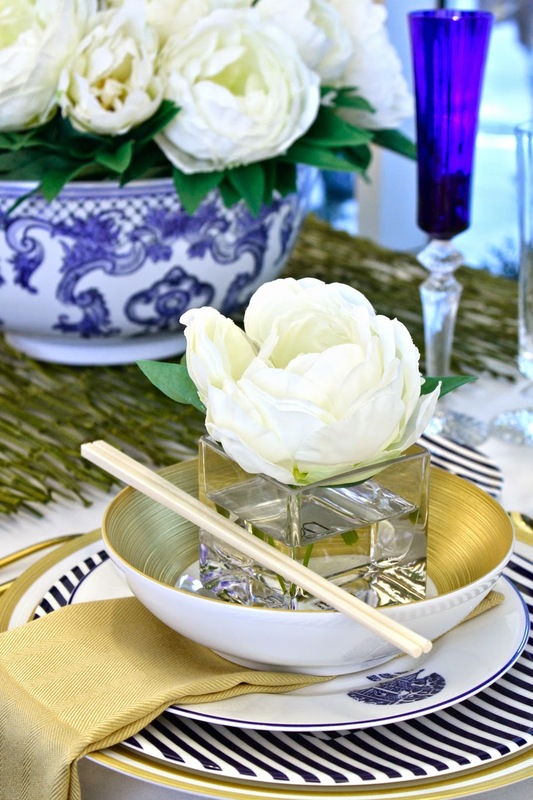 Another thing was practicality: I knew I could style this table with extras easily found in some of Manhattan’s treasure troves for budget styling, including the go-to Pearl River, a frequent secret weapon of stylists, florists, and party planners. 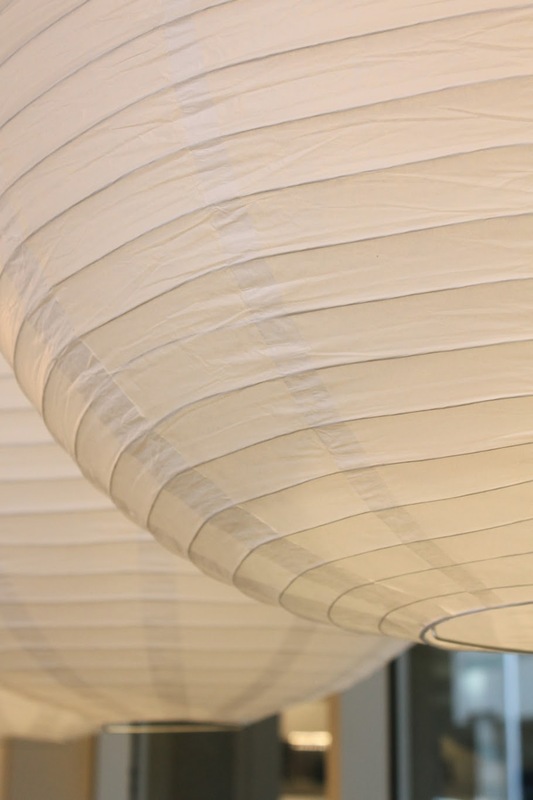 I loved the instant architecture provided by the quartet of the giant Pearl River paper lanterns, a HUGE amount of impact for the money (even if, teetering on a ladder perched on the table at 9:15 in the morning, I questioned my super-precise placement plan for hanging them, aligned and just kissing). They framed the scene, garnered street-side attention, and shfted the focus back down on the tabletop without stealing any of its thunder. The shopping spree continued at Pearl River with chopsticks (a certain need to make it up as I went along on install day meant I scooped up green, white and bamboo versions, without breaking the bank). Onward to the flower district, and at Jamali Garden, votives and glass gravel for an idea that would prove to be short-lived (more on that later!). 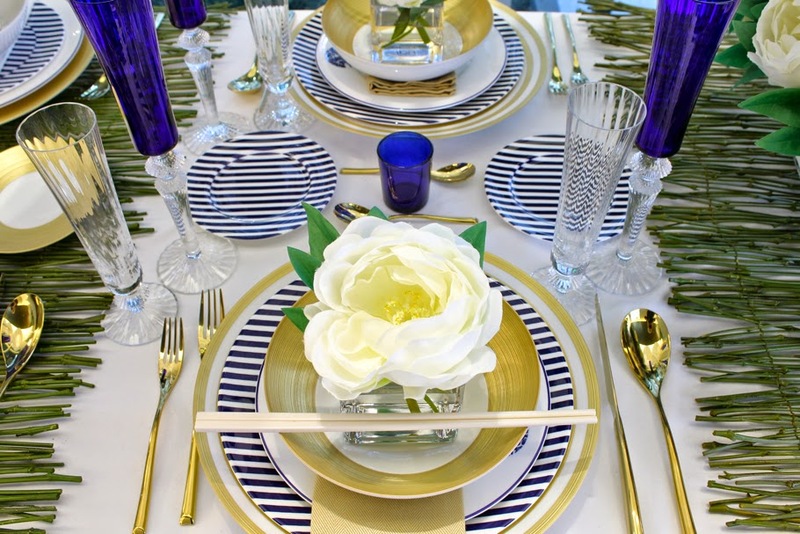 I love, on any table top, to add height, and then add heights in between those heights, so I was looking forward to using elements to fill the space between dish and the tall and gorgeous Baccarat Mille Nuits champagne flutes. 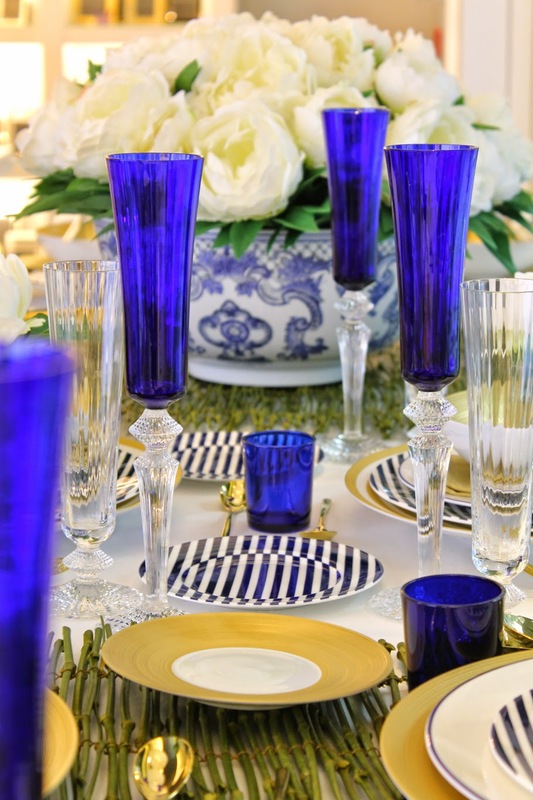 The votives in cobalt helped start that step up, while bouncing that blue between Baccarat stemware and china patterns. 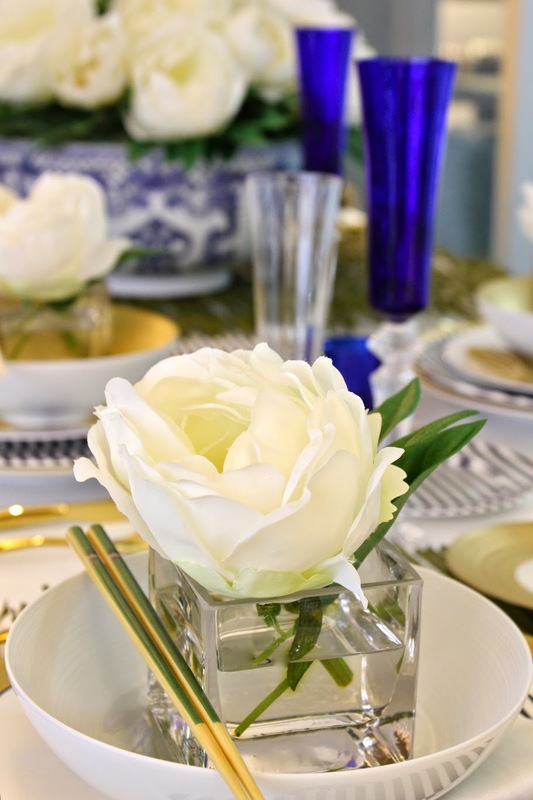 They were also a very budget-friendly way to give the table a luxe, lush and filled-in look, while not introducing anything new, color or material-wise, to the mix, another key to keeping the clean, contemporary but still-layered look I was shooting for. If I were setting this table for a one-night plan, there’d probably be fresh flowers. But this display had to last well into March. I knew immediately where to go, though... my generous and talented friends at NDI/Natural Decorations. They’ve helped fool visitors to my Modern St. Patrick’s Day and Derby Deconstructed rooms for Holiday House, and lucky buyers took more of their glorious handiwork home at last year’s Design on a Dime. 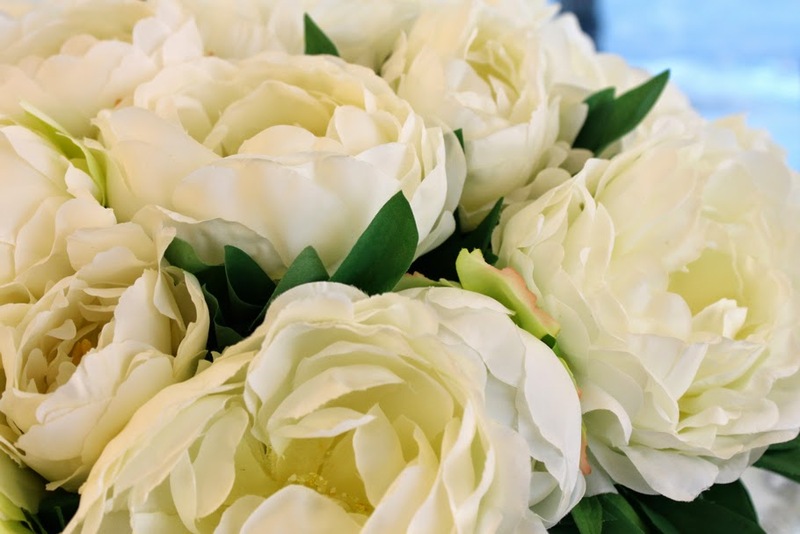 I’m also a big fan of “intentional white” when it comes to design, and I knew that an all-white scheme for the flowers would get great impact while still letting the merchandise stay the star. It would also give the whole set-up a bridal bent, in this outpost that sees more than its share of Bridal Registries and visits by brides-to-be. 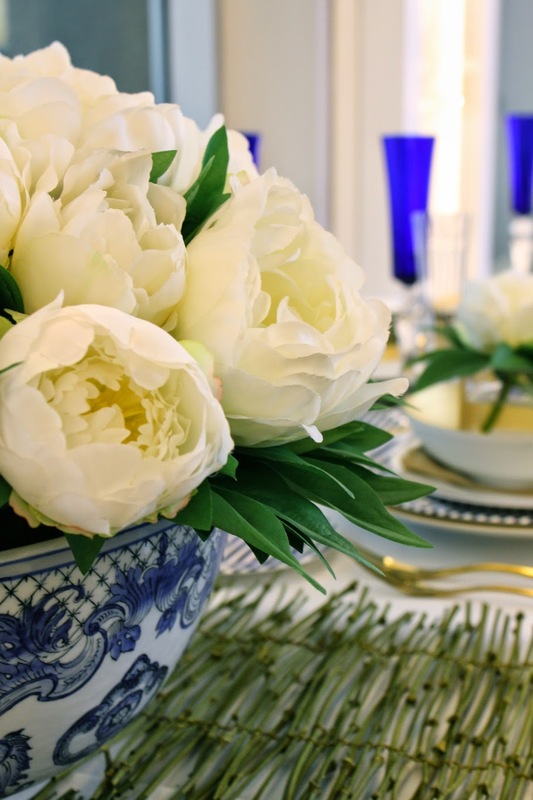 NDI’s Peony Cubes and Peonies in a Porcelain Blue and White Bowl fit the bill, perfectly, and recreated a look I’m fond of when using real flowers: you get maximum mileage out of selecting one color and type of flower, then just using it en masse. 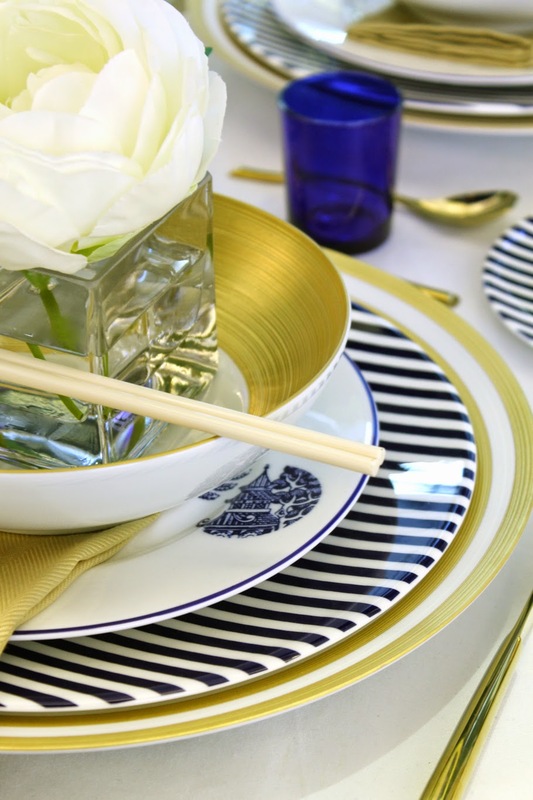 When people think of “fine china,” they’re quick to think of formality, “the good dishes” that only get trotted out for holidays, and dusty dinner parties. But this table would be no Miss Havisham moment. 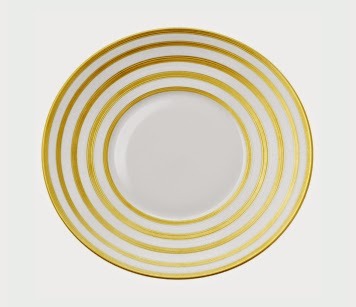 I wanted a modern and slightly masculine sensibility (women aren't the only ones picking out wedding china these days!). 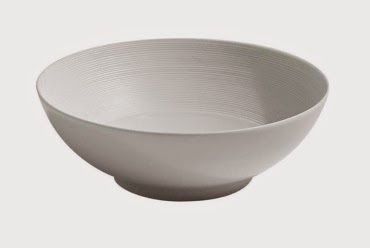 But like “all traditional,” “all modern” has a way of losing interest, too, so the modern patterns were joined by ultra-traditional stem- and flat- ware, in a very traditional placement. 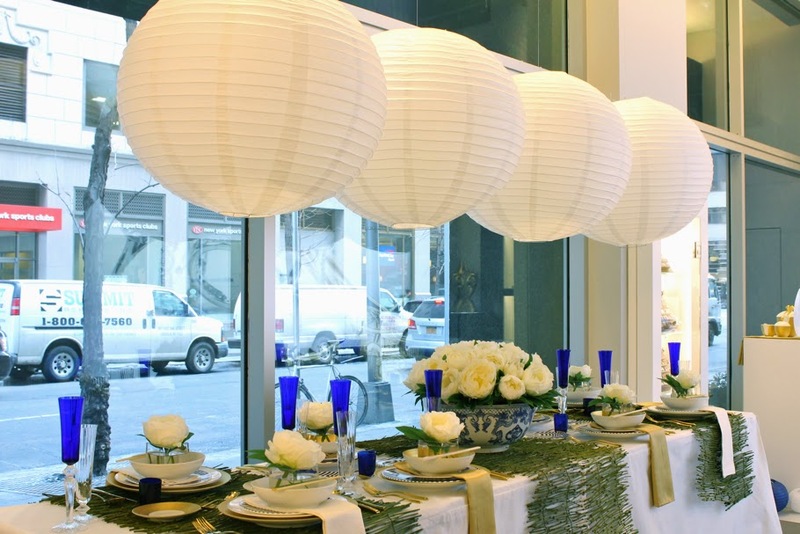 The casual/traditional push-pull continued with organic elements, fine cut crystal, and those breezy paper lanterns, and as it always does, the mix made it all the more interesting. It’s my overarching philosophy, for any project, any client: the best results come from the strategy of “Invest, Splurge and Save,” and while the main components here were just pulled from inventory, not purchased, the idea was never far from my mind. 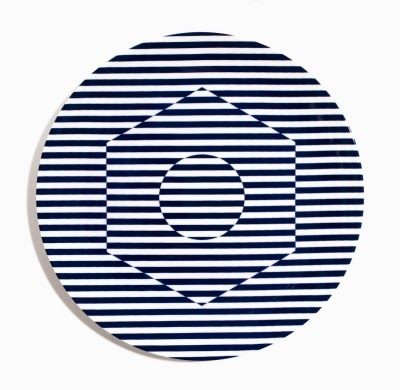 Investment pieces—pieces you could work around for years to come— were the basic white Hemisphere. 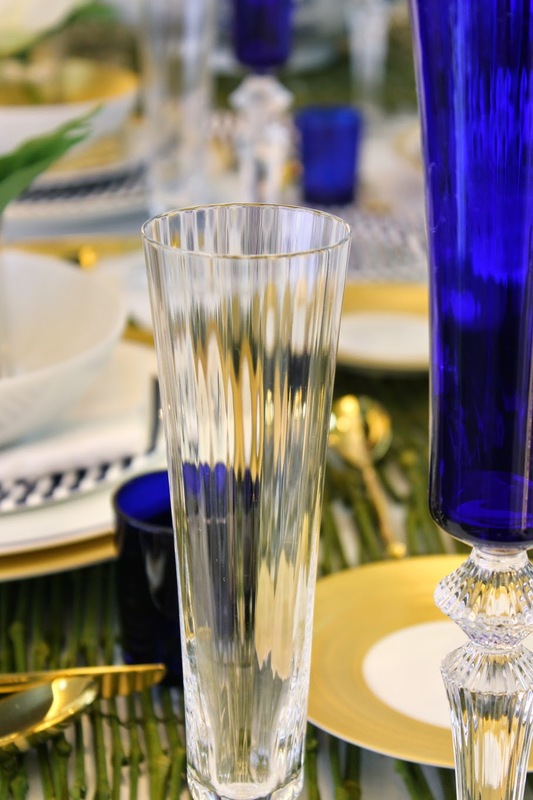 So, too, the clear Baccarat goblets, each standing the test of trend and time: you’d have each for as long as you’d want them. The Splurge pieces were the more patterned pieces and the cobalt goblets. 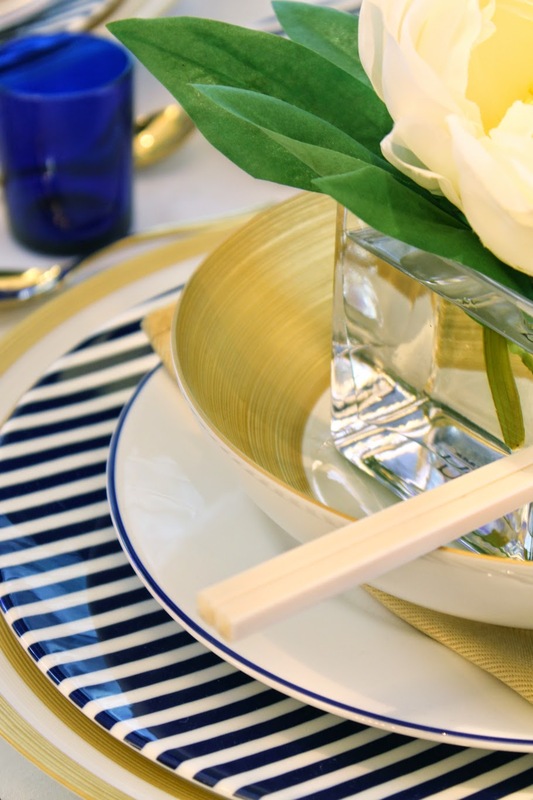 The Save came from the more temporary and theme-specific items: those paper lanterns, votives, and both the Crate & Barrel white and Bed, Bath & Beyond gold napkins. So that plan changed, and once again, NDI to the rescue: those individual cubes, originally intended to be scattered about the table, became wonderful mini centerpieces in a look I’m eager to recreate. 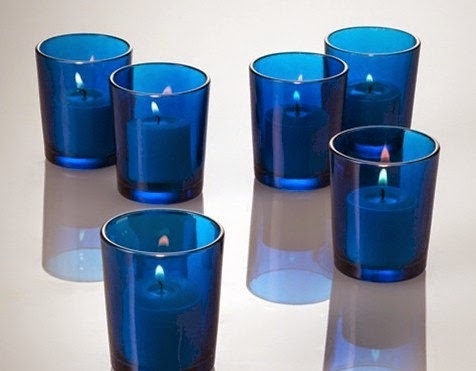 It gave that great mid-level height I love, and they’d make perfect gifts for dinner guests to take home at party’s end. They also, very practically, kept the chopsticks in place, and this time, without any cultural misstep. 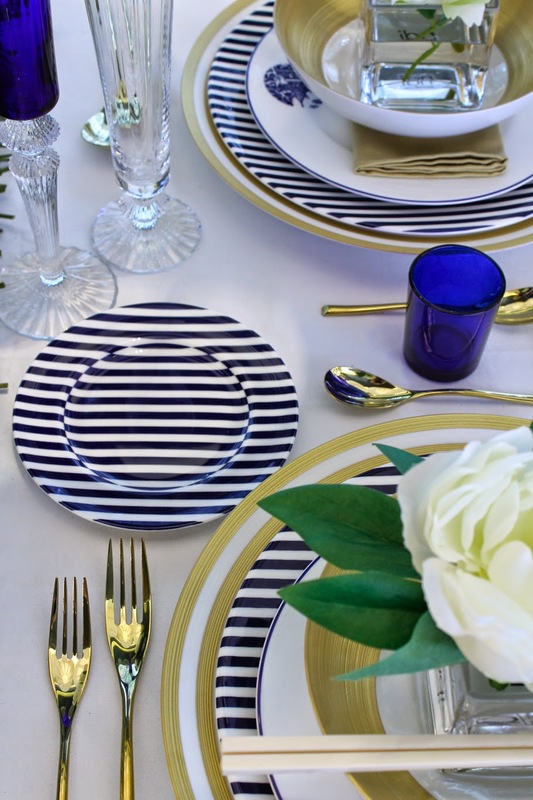 Big thanks to my new friends at Michael C. Fina for the opportunity to handpick from their wonderful array of tabletop items, mix and match brands, and overall, make it an experience I hope to repeat. Maybe I’ll get to use those dragons after all! Get Social! Find Michael C. Fina on Facebook and Twitter, Richard Brendon on Twitter and Pinterest, and follow me on Pinterest and Twitter!